This week, the British midwives of 1964 are surprisingly in sync with current health news in the United States. Two mothers grapple with hardships that can never be cured or eradicated. Hazel Becker, who lost her first baby in his sleep to what we assume is sudden infant death syndrome (SIDS), lives in fear of losing her second child. Betty Marwick was confident she could manage six children until her sixth is born with a cleft palate and requires much more attention and care. Episode 3 opens with the clinic offering a measles vaccination trial. True to history, the first measles vaccine was first made available in 1963 and curtailed the highly infectious disease that could cause deafness, pneumonia, brain damage, and even death. 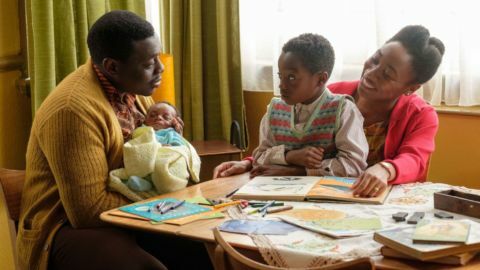 Though a common and frightening disease in 1963, Call the Midwife’s Poplar mothers were only won over to learn about the vaccine after Sister Frances led a big leaflet and information campaign. The episode arrives as the United States is experiencing its second-largest measles outbreak since 2000. The New York City Health Department reported that as of April 8, 285 measles cases have been confirmed in Brooklyn and Queens since October, and there are cases in Rockland and Westchester counties (learn more from the department, here). On April 9, New York City issued an emergency health order requiring vaccinations in an outbreak area in the ultra-Orthodox Hasidic community in Brooklyn. Misinformation about the vaccine is a frequent reason parents do not vaccinate children. The New York Times reported that Hasidic health professionals are now completing a pro-vaccination magazine and hotline to dispel myths of harmful effects. But back to London, 1964. Even the midwife Shelagh, Dr. Turner’s wife, showed trepidation at having the vaccine shot demonstrated on her own toddler Teddy during the clinic’s information session. He did get the vaccine, and so did other Poplar toddlers. Mrs. Becker, always worried about her baby girl’s health, wanted the 8-month-old vaccinated, but baby Dawn is younger than the trial’s age minimum of 10 months. After she took the time to learn about the measles’ dangers, she walks away livid. The Centers for Disease Control and Prevention (CDC) today says that one in 10 children with measles gets an ear infection, which can lead to permanent deafness. One in 20 children develops pneumonia and one in 1,000 develops encephalitis, which can lead to brain damage. Learn much more from the CDC measles pages. Nurse Trixie Franklin (HELEN GEORGE), Dr Turner (STEPHEN McGANN), Betty Marwick (LISA ELLIS), Valerie Dyer (JENNIFER KIRBY). The pregnant Betty Marwick (Lisa Ellis; EastEnders) has a husband who works at sea, leaving her the sole caretaker of their five rambunctious children at the moment. Even after her water breaks, she’s still managing the chaos in the home instead of getting to bed. Mother and baby Kirk go to the maternity ward, where she will have to learn to pump her milk. The baby doesn’t’ suckle his special bottle well and Betty, who thought she knew everything about being a mother, is in tears and exasperated. It doesn’t help that other mothers in the room wish they didn’t have to see a baby with a birth defect. Though her husband hasn’t’ returned home yet from Newfoundland, Betty’s mother-in-law can’t handle the responsibility of watching the older children, so Betty leaves the ward with the baby, despite Val advising her to stay. Called for a home visit, Dr. Turner examines Kirk, who has inhaled a bit of milk while feeding and irritated his lungs. The doctor assures Betty she’s doing really well, gives her antibiotics and says he’ll return the next day for another checkup. Is it Measles or Mourning? Hazel Becker brings her daughter Dawn to the clinic. Mrs. Becker rushes Dawn to see Dr. Turner because she has a rash. Phew, it’s not the measles. It’s Roseola infantum, a viral infection that causes fever and rash but is not considered serious (read more on it from the Mayo Clinic). Dr. Turner is sure Dawn will be fine and takes the time to acknowledge what he’s learned from Mrs. Becker’s medical file. “Don’t tell people about that. I don’t talk about it,” she stammers. “He was healthy too… and he died,” counters Hazel. 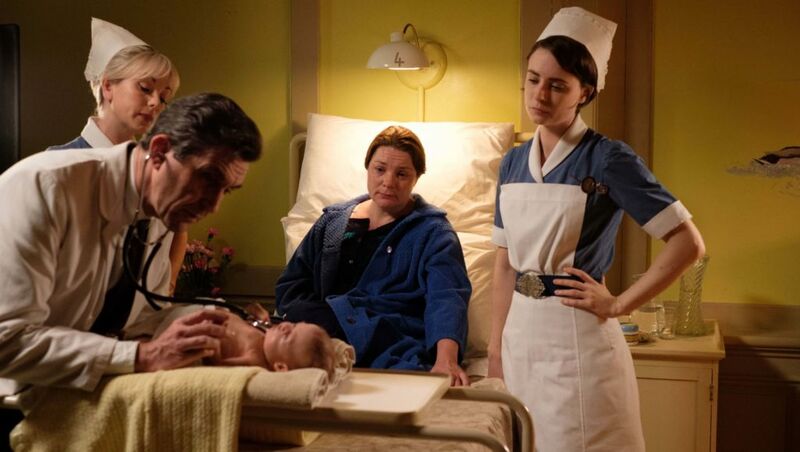 Like he did for Betty, Dr. Turner assures Hazel that he’s confident in her ability as a mother. In Episode 3 we get a little more insight into the clinic’s new prim-and-proper receptionist, Ms. Higgins (Georgie Glen). When she saw the records of Hazel Becker, she alluded to knowing the pain that can surface around the anniversary of a death. Now, she extends herself to offer Mrs. Becker a ride home from the clinic. She speaks with Mr. Becker, who reveals the name of their lost son, and that his wife couldn’t bear to attend his funeral. Mr. Becker tells his wife he needs to talk about their son. He’s scared of what it could do to their marriage if they don’t talk about it, and how it could affect their daughter. Betty tearfully confides to Val that she fears she’s a monster for having thought that maybe it would have been better if she had let baby Kirk “slip away.” She recalls the joy that had surrounded the birth of her son Keith, and that she even received a round of applause, which she had never experienced in her whole life. “No one’s clapping now.” She says Kirk could be better off with someone else who could look after him properly. Val goes to Sister Julienne to discuss that Betty might give Kirk up for adoption. Betty admitted she doesn’t’ feel the urge to nurture Kirk like she did her other children. Julienne suggests some more support for the mother. Val arrives at Betty’s home and assigns the oldest teenage son some responsibilities. Betty is touched when he also defends his youngest brother from neighbors who make unkind remarks. Baby Kirk recovers from his infection and gains three ounces. Betty’s maternal confidence has kicked in and she tells Val to cancel the visit from the adoption agency. Kirk still faces several surgeries, which includes risks like future hearing problems. Ms. Higgins pays another visit to the Beckers, holding a small rose bush plant. “I’m not from a large family,” she announces. She has an uncle in Canada. Her parents died in air raid in 1941 and her uncle hasn’t been able to see their grave. Her uncle sends her photos of a rose bush he planted in their memory. 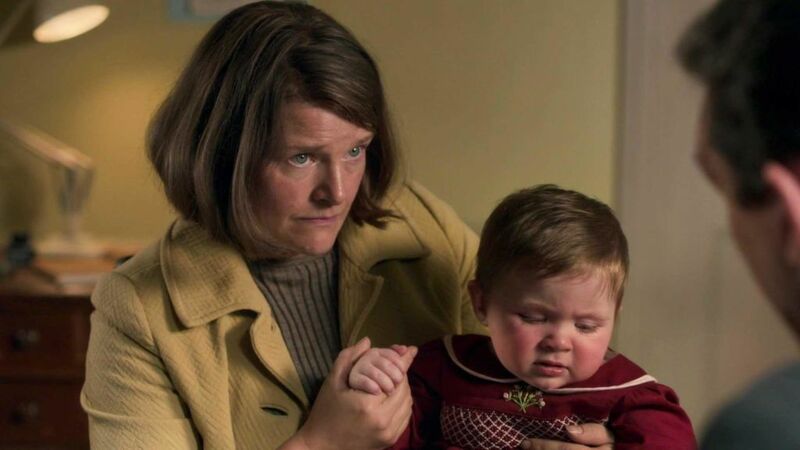 After Mr. Becker accepts the plant, Call the Midwife’s two most rigid characters this season – Mrs. Becker and Ms. Higgins ­– share a hug. 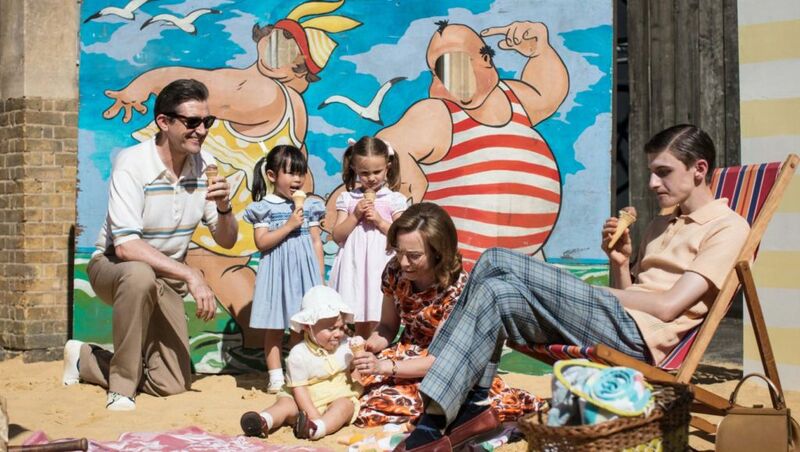 L to r: Dr Turner (STEPHEN McGANN), Little May (APRIL REA HOANG), Angela Turner (ALICE BROWN), Shelagh Turner (LAURA MAIN) with Teddy, Timothy Turner (MAX MACMILLAN). We learn that Violet’s election campaign from Episode 2 was successful – she wins a spot on the council! She’s let her new position go to her head a bit, but let’s give her a pass on that. She gets to feel like the Queen when she cuts the ribbon on the Poplar Whitsun Bank Holiday Play Beach, where all the sisters, midwives and neighbors look delighted. The Sergeant leads the scouts in three cheers for Phyllis Crane, who came up with the idea for the ersatz beach outing for the area’s impoverished residents. It’s the first time Phyllis reacts with a genuine smile to the attention Sergeant Woolfe showers her with. Mrs. Becker has let her husband build a crib for Dawn, so she can sleep in her own room, and the couple have planted their rose bush for their deceased baby Steven on the balcony. “There is light. There is. 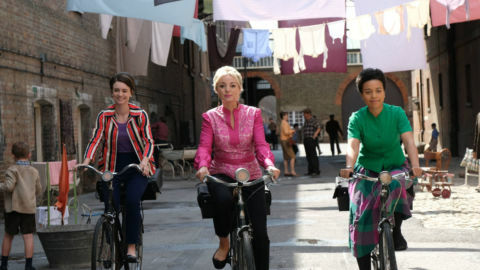 Look for it!” the Call the Midwife narrator insists to encourage those who feel darkness in their lives. If you enjoyed the expanded role for actress Georgie Glen (Ms. Higgins) this week, you can see more of her work in Episode 3 of Les Miserable – Masterpiece, in which she gets to wear a nun’s habit. 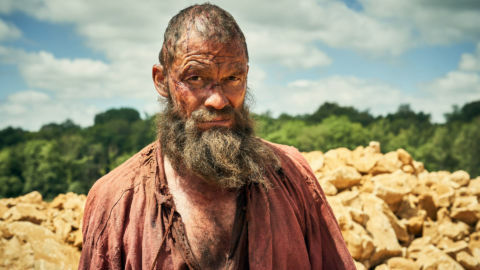 She plays the French abbess who provides refuge for Jean Valjean and Cossette.